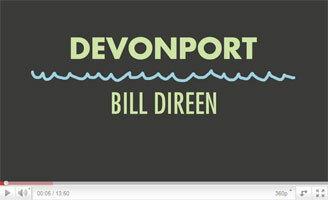 The Holloway Press is pleased to announce the publication of Devonport: A Diary by Bill Direen, written during his tenure of the University of Auckland/Michael King Centre/Creative New Zealand Literary Fellowship in 2010. Devonport is the first in The Signalman’s House Series in which The Holloway Press, in association with the University of Auckland and the Michael King Centre, plans to publish a work by each of the annual fellows who occupy the Signalman’s House on Mount Victoria in Devonport, the home of the Michael King Centre. Through these publications the link between the University of Auckland and the Michael King Centre will be strengthened. Bill Direen, writer and musician, has a writing career that goes back at least 25 years (Inklings, 1988). Originally from Christchurch and Dunedin, Direen has recently been living in Paris and previously spent three years in Berlin. He is best known as a poet and musician (especially for performances and recordings with his band The Bilders), but he has also written theatre scripts, lyrics, stories, essays, short and long fiction. He has published extensively across all of these genres. His longer works have been experimental and are often trans-generic (making use of poetry, fiction, history, autobiography, mythology and monologue). In 2006, Direen launched the annual international literary magazine Percutio, which is dedicated to aspects of the creative process and to works that bridge cultures. Among his many publications some of the most recent are Jules (Alpha Books, 2003, fiction), Coma (2005, Titus Books, fiction), New Sea Land (2005, Titus Books, poetry), Song of the Brakeman (2006, Titus Books, fiction), Enclosures (Titus Books, 2008, fiction). In 2010 he edited Landfall 219, a special issue devoted to music. Devonport: A Diary (which is accompanied by Esplanade, a brief related fiction) is a lively, thoughtful and idiosyncratic collocation of observations on landscape and culture, reflections on writing and a spirited record of daily living in a rich marine, domestic and urban environment new to the returning New Zealander. Devonport is designed, letterpress printed and bound for The Holloway Press by Tara McLeod; it is printed on a Littlejohn cylinder press. The type is 12pt linotype Janson set by Longley Printing Co. Ltd. Paper is 104gsm Sundance natural white. Cover is 216gsm Via felt sage. 30 pages. The edition is 100 copies. Devonport was launched at the Michael King Writers’ Centre, Mount Victoria, Devonport at 4pm on Sunday May 22. Copies bought on or before 12 June are $80. The price after this date is $100.